Wow ... a Privat with US keyboard. I never heard of the "Learnette" name before. Where is it, on the paper table? ... and what's the serial number? That's the second Learnette I hear from. The one sold last summer was # 204073. Could it be the same? Yes, on the paper plate, Richard, I'll add a photo of it. Yes, Georg, same one, the serial number is in the post, right under the first image. Oh yes, now I see that I saved a photo of this machine a few months ago. Promptly forgot about it! I have also seen one labeled Gloria. Man, Voss is the best looking typewriter brand I've seen. They are visually striking!!! Not my everyday typewriter but I like to take it out once in a while so I can feel fancy and sophisticated (two adjectives that I think of with my Voss). How interesting. Not that I missed seeing this serial number - the usual distraction. But that it's the same machine. So that means only one Learnette known. Good there is a Gloria around. BTW, Gloria was one of the intended export (to Britain) names of the little Erika I know best as the Bijou three-bank. Yes, I love that typewriter. 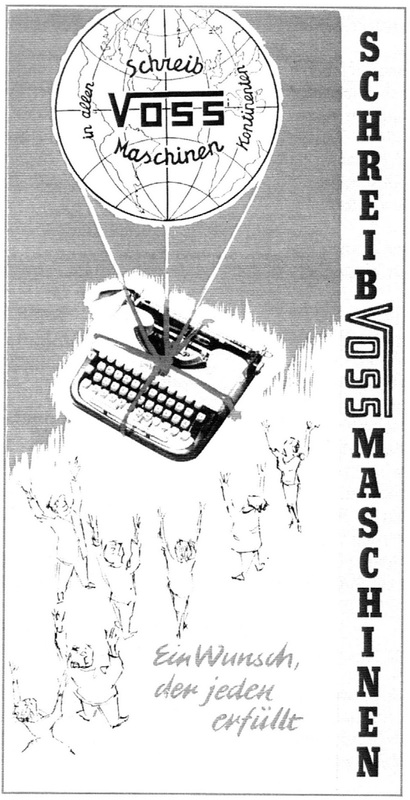 I wrote my first novels on that VOSS, and I bought it on a fleamarket in 1985 when I was 15 years old. One of the novels was published five years ago in a german publishing house. Meanwhile my VOSS is not in good condition. Now I`m using a Adler Tippa. Nice, too.